The devil is in the details is the old saying. And it’s true for so many things. It is one of the reasons this blog transformed from being a blog that I simply used to compile my own family recipes and really turned into more of a teaching blog. Not long after I started this website, I started hearing from new cooks or less experienced cooks who were really enjoying the recipes but would ask, what I thought, were questions that everyone just knew the answers to. Maybe it was the difference between sweetened condensed milk and evaporated milk. Or could I tell them what size can of cream of mushroom I used or how much exactly is a pinch or a palmful of something? Could I give them more exact measurements? These were just little bits of knowledge that I took for granted and thought everyone else knew too. But it turns out, a whole lot of folks didn’t. And I was honored that they were entrusting me to help guide them. So I learned early, when sharing recipes, that these small details were super important to many people. It is why I take photographs of the ingredients. It’s why I take step-by-step photos. Because, although I may say in my directions to brown and crumble ground beef, some folks may not understand exactly what that means, and by seeing the picture, it helps them know they are on the right track. Yes, it means a bit more work for me behind the scenes but I love to teach and guide folks on how to cook. It is something I have felt called to do since starting this website. I absolutely LOVE working with new and beginner cooks! And if that one picture helped them turn out a successful meal then that makes all the work worth it. I once heard from a Home Economics teacher that uses my website in her classroom. She hooks up her laptop to their smart board in the class and goes through my recipes with the step-by-step photos before the kids start making the meal. I was amazed and astonished and felt so blessed that I was helping this teacher to teach her students the basics of cooking. What an honor to be an extension of this teacher’s instruction! So details are important not only in cooking but in crafts. 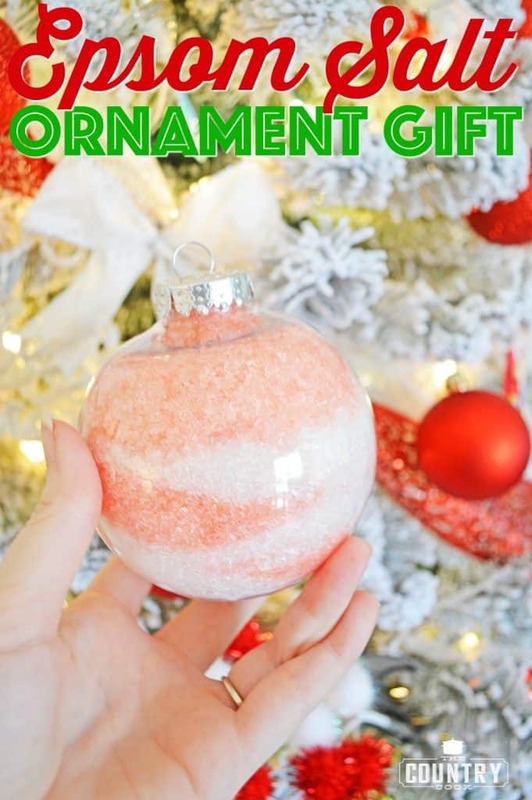 Have you ever tried a craft (or recipe) that you found on Pinterest and it just did not turn out anywhere near how it should have? Most of us have. I am not crafty at all so it’s important that I’m given really small details that could affect the outcome of that craft. Exactly like a new cook would need to know the difference between sweetened condensed milk and evaporated milk. It’s not that it is a bad craft or recipe, it just means that sometimes the small details are needed to help us make it AWESOME. Such was the case with this craft. I thought it looked absolutely adorable but I wondered why I was having trouble with something that really should have been SO simple and it was because I was doing a couple of small things wrong and it was throwing off the whole project. But once I figured out what was needed to make this look like how it should look, it came together in a flash and now looks so adorable sitting on my coffee table. 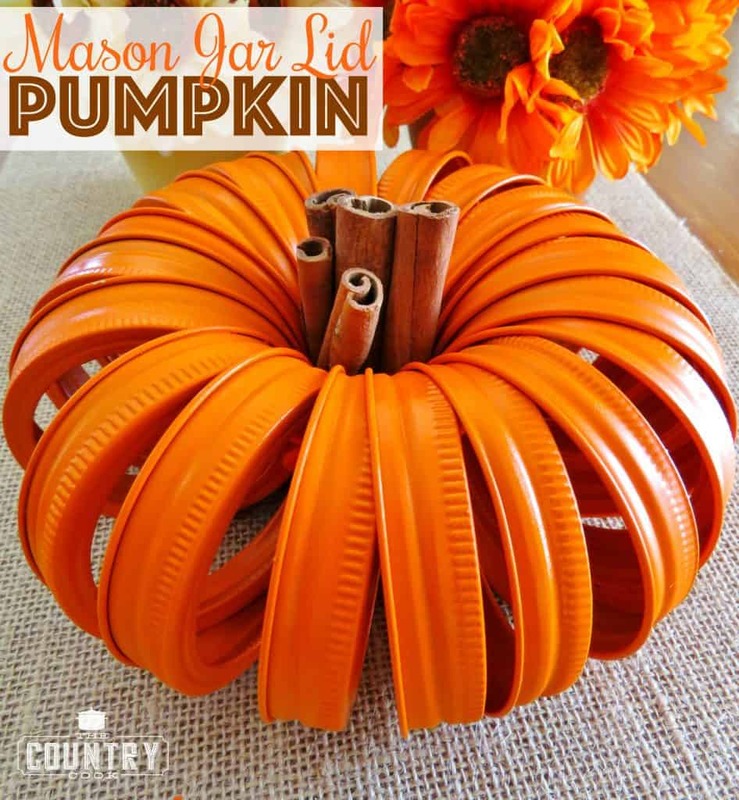 Seriously, I love the country and homey feel of this Mason Jar Lid Pumpkin. 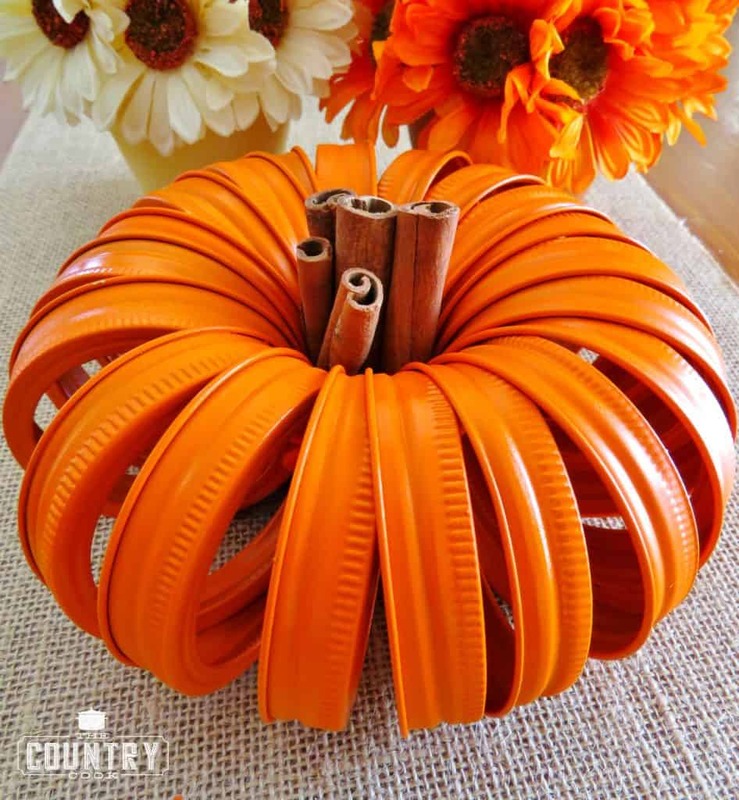 I think that this would make adorable centerpieces for your fall celebrations! Let’s get started! Note: One of the things I learned after purchasing the ingredients was I bought the 3-inch size Cinnamon Sticks and I should have gone longer. They look fine but I would have preferred a longer “stem”, so the next one I make, I will buy 4″ Cinnamon Sticks. Also, boxes are sold usually with the lids and the bands combined. Just save the lids for your next canning adventure. Lay out some newspaper or craft paper in a well-ventilated area. I did this outside, which really offers the best ventilation, and on a day that is not windy or rainy (obviously). Lay out all your mason jar bands onto the paper, making sure several inches separate them. Note: if you are sensitive or have respiratory issues, I also recommend wearing a protective mask while spray painting. 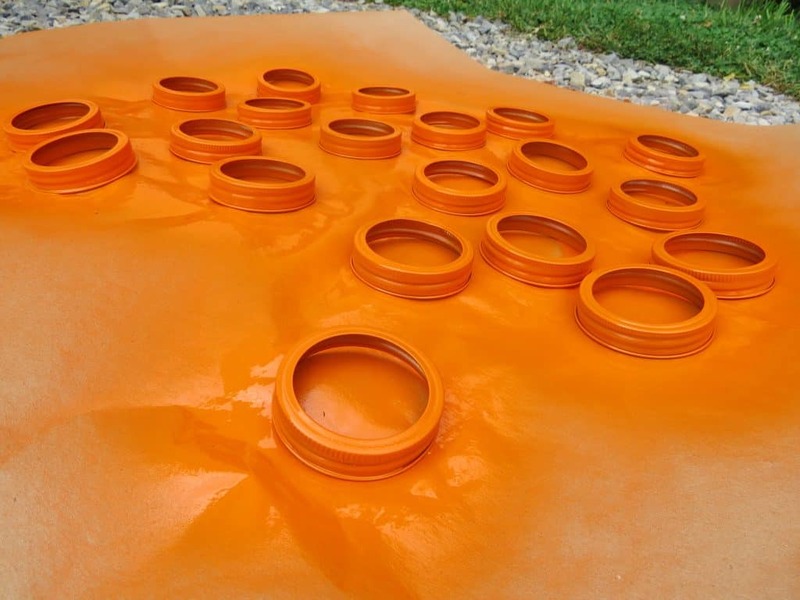 Spray paint the bands well with orange spray paint. I spray painted one side first, allowed to dry for a few hours, then I flipped them over and sprayed the other side. Make sure you are spraying the sides well too. Allow lids to dry completely overnight. 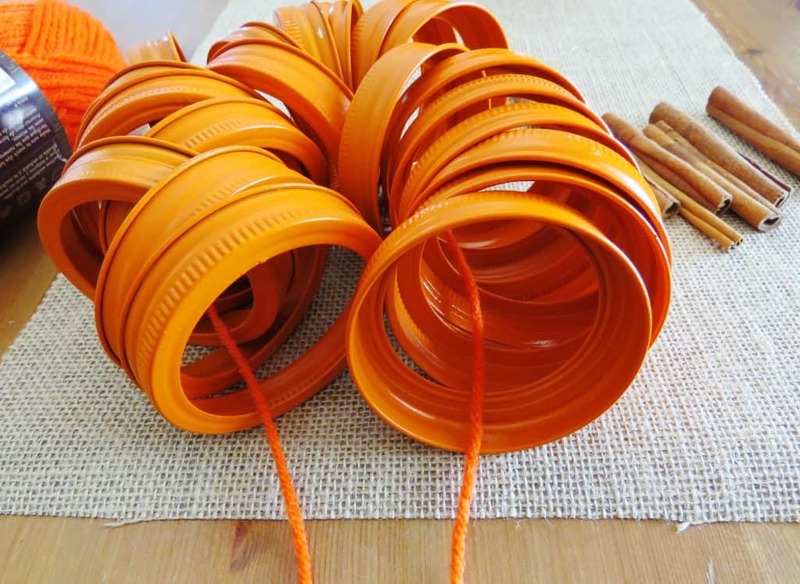 Wrap a piece of orange yarn through the bands. Then pull as tight as you can. You want a really nice, taught string. It may help if you have someone helping you on this part. My son put his finger on the string to keep it in place so I could tie a tight knot. *This is another important detail to ensure this pumpkin shapes up properly when fanning out the lids. *Cut off any excess string. Once you have it tied, it should just be a matter of gently separating the lids so they are spaced evenly. 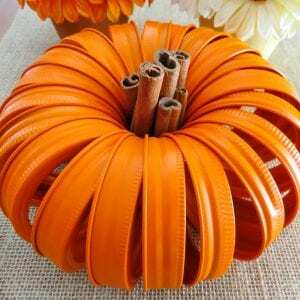 Pop a few cinnamon sticks in the middle to be the pumpkin stem and you are done! 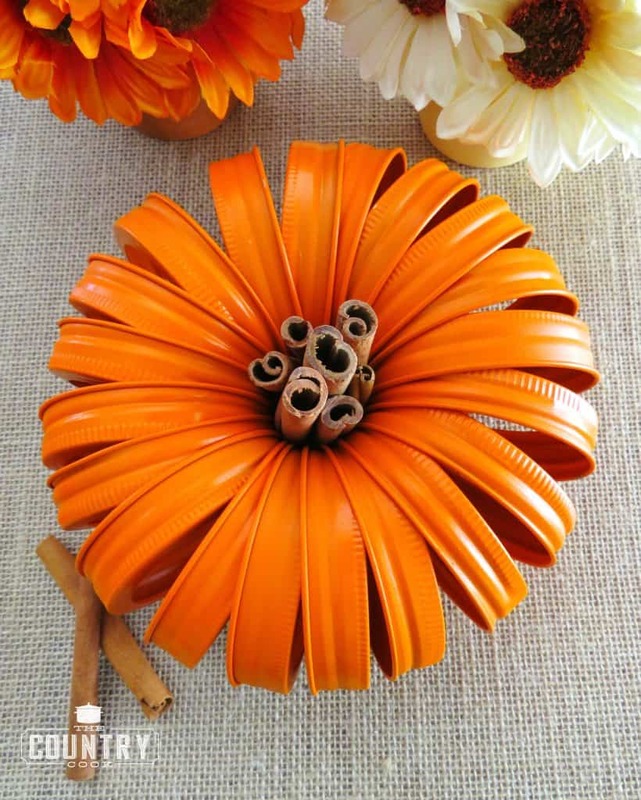 It may take 5 or 6 cinnamon sticks per pumpkin you make. It just depends on how wide the sticks are. Looking for more Mason Jar projects? Check out my Mason Jar Lanterns! Lay out some newspaper or craft paper in a well-ventilated area. I did this outside, which really offers the best ventilation, and on a day that is not windy or rainy (obviously). Lay out all your mason jar bands onto the paper, making sure several inches separate them. Note: if you are sensitive or have respiratory issues, I also recommend wearing a protective mask before spray painting. 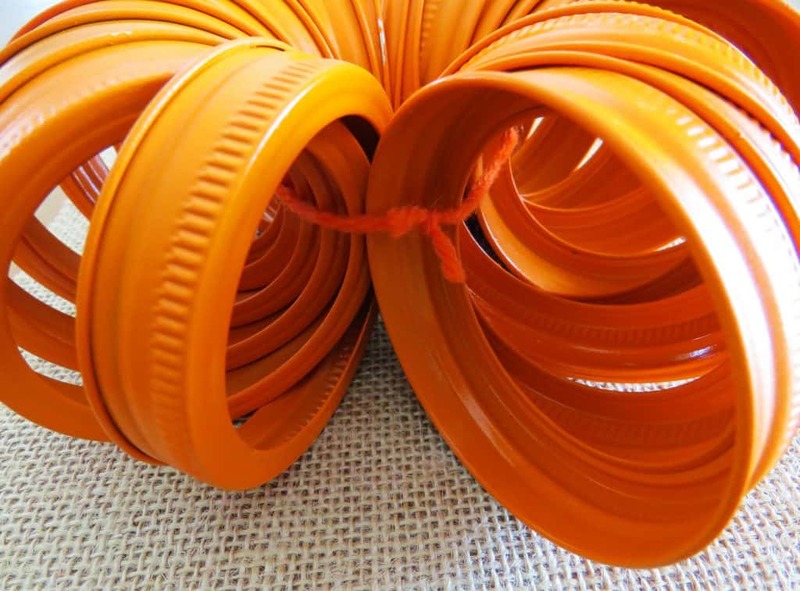 Spray paint the bands well with orange spray paint. I spray painted one side first, allowed to dry for a few hours, then I flipped them over and sprayed the other side. Make sure you are spraying the sides well too. Allow lids to dry completely overnight. Once lids are completely dry, it's time to tie them all together. First, make sure all your mason jar bands are facing the same direction. Wrap a piece of orange yarn through the bands. Then pull as tight as you can. Cut off any excess string. Pop a few cinnamon sticks in the middle to be the pumpkin stem and you are done! I am trying this but used newspaper to lay them on and they stick to the paper. Also, I plan on using old bands that are a little rusty do I need to sand them and then use a primer before actually painting them? 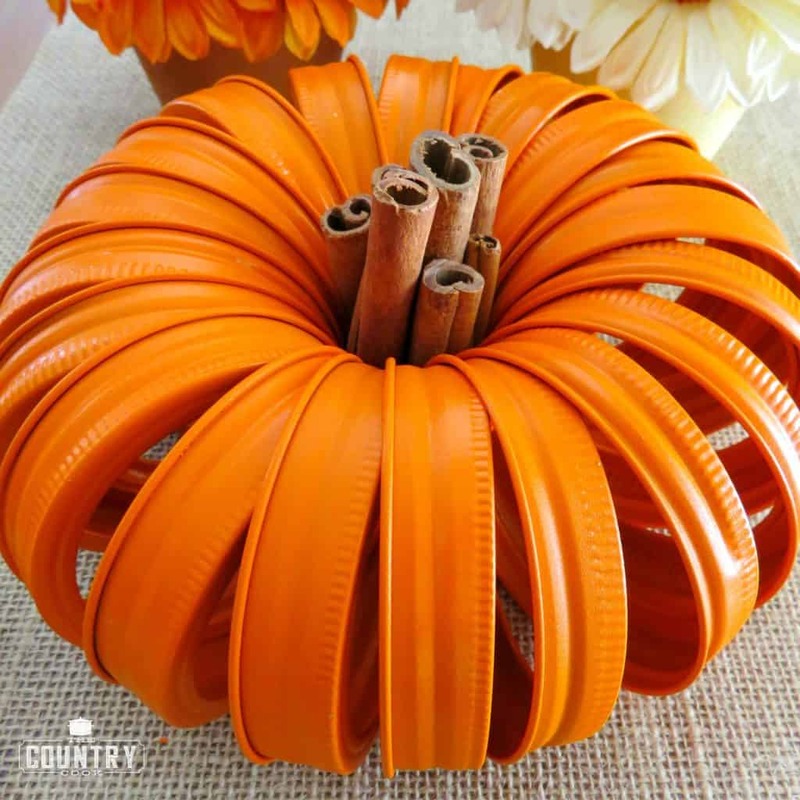 Now that pumpkin season is upon us again and mason jars are all the rage, and easy to find in many stores, this craft idea is on my list! I have a question. I'm planning this for a craft night and I have 24 women who would like to make this. So my questions is how much cinnamon sticks should I get. I know each pumpkin needs 5-6 sticks. It's cheaper to buy in bulk so would you think I need 1,2, or 3 pounds of 4" cinnamon sticks? 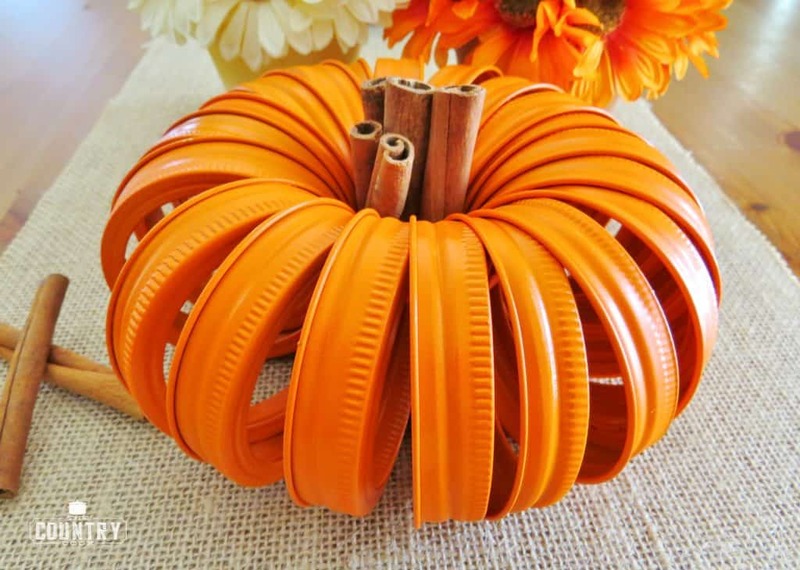 I used ribbon instead of paint on my mason jar pumpkins. I cut my ribbon the length to fit around each lid, applied a very thin line of school glue to one edge of the entire top length of ribbon and rolled it around using the lid ridge as my guide. I used 3 colors of ribbon, Orange, white and a sequence gold (which really gave it a Cinderella look!). 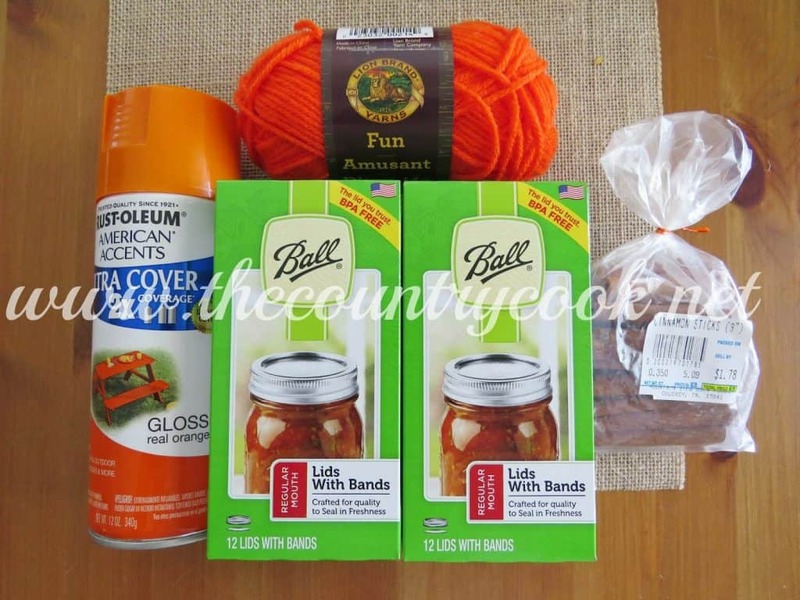 I strung them up in this order; Orange, gold, Orange, gold, white…and to thicken my cinnamon sticks I tied 4 sticks in a bundle with jute, then used orange ribbon on top of the jute for thickness. This gave them a snug fit when pushed sticks were pushed into the center. I also added white and gold ribbon (desired length) to the center stem for a pretty fall off the pumpkin. I found that 15 small rings to be perfect or 20 large rings. you are awesome kiddo, so talented and simply creative. Do you have to use 20 kids or can less be used to maybe make smaller pumpkins? Do you know the dimensions of the finished project with the wide mouth lids? Do you think a zip tie would work better than yarn? I LOVE this idea, but would like a more "sturdy" option. I used craft paint. I’m wondering should I put a clear top coat over the paint. To keep the paint from coming off and to make it last longer. This is just the cutest thing I have seen! 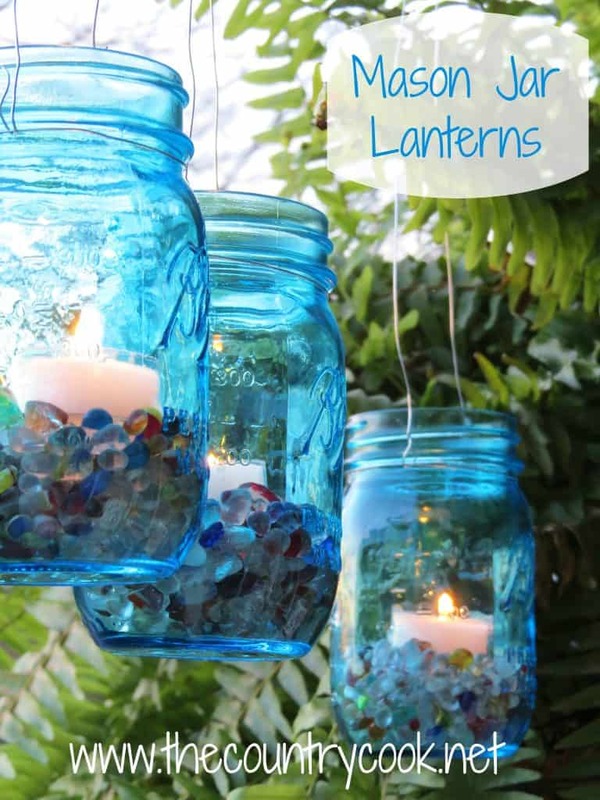 I’ve gotta try it out and since I have tons of mason jar’s this is just a perfect way to use them up. Hope you love it! Definitely a great project for all those lids ya got hanging around! I am having trouble making my lid appear as one circle. Thanks for the exactly count of rings to use. I tried this four (very frustrating) times before I found your step by step directions!! Twenty is the magic number. Glad you were finally able to make it without frustration. Perfect fall decoration. Thank you for your post!!! I’m making these for gifts for my family! I got all the rings painted & put my 1st one together & it’s perfect! Only question… my paint flaked off a bit in spots. I will retouch-no big deal, but do you ever have this problem?